Want to let your kids call an Uber on your dime? Now you can do so without surrendering your payment details. With Uber’s new Family Profiles feature, users can share their method of payment with other people. Just go to Settings, scroll down to “Add a Family Profile,” and choose up to 10 contacts that you’d like to have access. Those contacts are then able to choose the Family profile as a payment method when requesting a ride. Compared to just manually entering your credit card details on someone else’s phone, Family Profiles offer more control. The profile’s organizer automatically gets a receipt for every ride, and can presumably revoke access (in case the kids start abusing their newfound freedom). But Uber doesn’t mention any way to approve ride requests on the fly, so there’s still a bit of trust involved in linking people to a profile. Uber says there are no limits on who counts as family, and says users could easily apply the feature to friends and co-workers (though Uber already offers Business Profiles for the latter). For now, however, Uber is only making Family Profiles available in Atlanta, Dallas, and Phoenix. There’s no word on when the feature might expand to other cities. 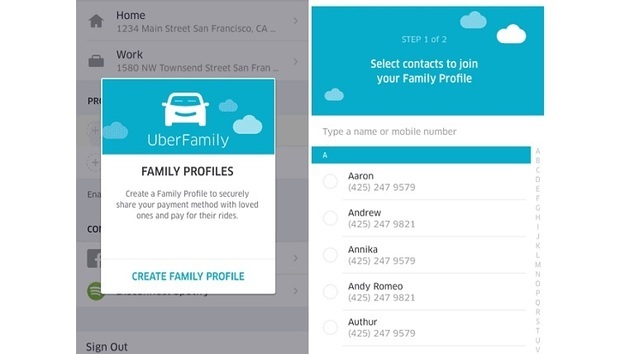 Why this matters: Family Profiles are one of a few specialized billing options that Uber now offers. Users can also switch to a work profile for logging receipts or paying with a company credit card, and can split the bill with friends. It’s not hard to imagine this flexibility eventually benefitting other uses for Uber, such as package and food delivery.